The setting of the Sonia Rykiel fall/winter 2016-2017 ready-to-wear runway show at Paris Fashion Week was spectacular in of itself, without needing to focus on the clothing itself. However, we can easily say that despite the cooler seasons being of a darker, more austere affliction, we can easily see the beauty radiating from every piece that is diligently brought forward by models who can carry themselves in a manner to make Julie de Libran proud. Ah, but it was a lovely show, with the Romanesque structures all about and a runway used, which very much enjoys the addition of strict corners, effectively giving a larger audience a better view of each ensemble. And what ensembles they are! Red hues seem to be the main focus of the brand for the fall season, which is perfectly fine by us since red only serves to enhance the figure, the darker shades only adding to the mystery and chic sophistication of the women wearing it out. From fur coats to zip-up pantsuits that were paired with black blouses, the girls looked fantastic. Red faux fur appeared on some blazers as well, with panting trousers in twin prints for the perfect office look. Chic and defined, there is certain elegance to all that the Sonia Rykiel label brings to us. 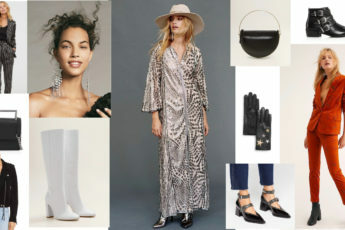 When speaking about the top trends to be found here, there are a few you can clearly see throughout which have been popping up in nearly every collection since the start of the Fashion Weeks back in New York, followed by London and Milan. Paris is no different, adding in the plunging necklines, the fluttering strings, the frills and layers along with the long hems and utilitarian boots. Thin black belts around the waist accentuate the figure and add to the provocative nature of some of the dresses found on the catwalk today. Combinations of red and black are a common sight, along with the black and white, the former appearing on striped dresses, striped tights and not-so-striped color blocks in tops and skirts. Pleats and stripes are a common enough look, with ribbons in red and black also garnering lots of attention. The stripes are certainly to be reckoned with though as we notice them everywhere, from tights to dresses to skirts and pants, sweaters and turtleneck pieces with furry sleeves. In terms of accessories, we have to admit that Sonia Rykiel has a knack for them, the brand enjoying bringing in some of the less focused on trends from the seasons past. This includes the belt bag that is larger than a wallet but smaller than most purses, arms left free by keeping it at the waist and ensuring it is the perfect travel fanny pack. Colorful striped furry handbags also make an appearance, probably falling among the most interesting of this sort of accessory seen on the fall 2016 runway season. There is no doubt that at the end of the day, the colors, styles and cuts all sway in favor of the brand should it come down to the top designer collections to be seen at the Paris Fashion Week.